IN POWER FROM 803 to 814, Khan Krum made indelible mark on Bulgarian history Krum was an energetic, courageous and steadfast ruler, ruthless when necessary, keenly pursuing the expansion of his state. First he delivered a crushing blow to the Avar IThaganate, bordering Bulgaria to the north. Thus Bulgaria's territory was expanded to cover the lands between the Danube and the Carpathians. Byzantme chroniclers started to refer to it as "Beyond-Danubian Bulgaria". New Slavic tribes were incorporated into the state. A common border was established with the empire of Charles the Great and Bulgaria became an outstanding power not only in the Balkans but in the whole of Eastern and Central Europe. Faced with Khan Krum's goal of incorporating all lands inhabited by Slavs and Bulgars into his state, the Franks and Byzantines were compelled to reckon with Bulgaria. It is understandable that the Byzantine emperor also felt alarmed. The first campaign of Nicephorus I Genik against Bulgaria was prevented by an internal plot. Then it was Krum's turn to prove that attack was the best means of defence. In 808-809 the Khan's soldiers defeated the Byzantine army in the Struma valley, seizing an immense loot and much gold. The defenders of Sredets (Serdika) laid down their arms and surrendered the town which was later to become Bulgaria's capital. Krum was ready to march on Macedonia. Nicephorus I made a retaliatory move when in 811 the Byzantine army crossed the Balkan range through unguarded side passes and headed towards the capital, Pliska. The Khan was not in Pliska at that moment and after a fierce battle the Bulgarians were forced to retreat The Byzantines slayed women, children and old people, burned the capital and destroyed the Khan's palace. Krum sent a message to the basileus: "Alright, you won Take what you please and go in peace." But Nicephorus rejected the proposal. It was time for the Bulgarians to get their revenge. During the night of 25 July they laid siege on the Byzantine army in the Vurbitsa pass. The Byzantines were crushed like never before. The Emperor and most of his commanders were killed. 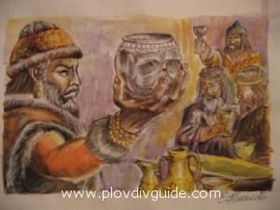 To celebrate his victory, the Khan had the emperors skull lined with silver and drank from it. Having taken his revenge, Krum proposed peace. When met with a refusal, he led his army south to the area between the Struma and the Maritsa, seizing Byzantine towns and strongholds. The population was sent to territories beyond the Danube, so as to incorporate new lands more easily into the Bulgarian state. Then (rum extended another proposal for peace. Despite his victories, he set a very modest condition: renewal of the treaty from Khan Tervel's time. When the new emperor refused, the Bulgarians turned on the fortress of Messembria (Nessebar). A memorable battle was fought by the town of Versinikia, not far from Adrianople, on 22 June 813. Once again the Byzantine army was routed and the Khan triumphed. Having besieged Adrianople, in a few days the Bulgarians reached the walls of Constantinople, filling the hearts of Byzantines in the besieged capital with horror. The emperor proposed peace negotiations with the perfidious intention to kill the Bulgarian Khan. Krum avoided the trap but was enraged by the Emperors' plot. The Bulgarians ravaged the lands between Constantinople and Adrianople, looting and taking prisoners. Adrianople fell, giving Krum the nickname of Strashny [the Terrible): a stern ruler, merciless to his enemies. However, the raid on Constantinople had required huge forces. The feverish preparations took almost a year. The transportation of the battering-rams alone required the building of 5,000 iron-bound carts and 10,000 oxen. The Khan's sudden death on 13 April 814 put an end to his dream to enter the imperial palace as a victor. Clashes with Avars and Byzantines never deterred the Khan from proceeding with the consolidation of his state. He would even learn from his enemy, using Byzantine experience in warring and governing. But he is equally celebrated for another important contribution: Bulgaria's first written laws. His under- standing of the interests of his state and the stories of the captured Avars about the collapse of their state, urged Krum to introduce law and order in Bulgaria. Khan Krum's laws protected property against encroachment by thieves and made slander and drinking severely punishable. His laws were applicable to all Bulgarians and ensured subsstence to beggars and unique state protection to the poor. Krum's laws allowed him to unite Bulgarians and Slavs into a strong, integrated and centralized state and gained him the reputation of a remarkable and magnanimous ruler. None of his predecessors had contributed as much to the consolidation and expansion of the Bulgarian state. None had achieved such an indisputable rise in terms of both internal and external development.